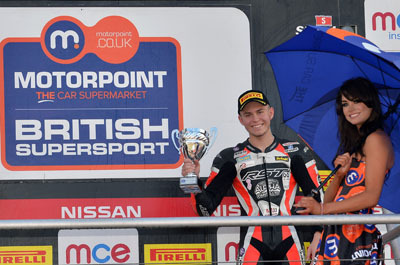 JOSH Corner finished the 2014 season in third place in the Motorpoint British Supersport Evo championship – less than 24-hours after being airlifted to hospital following a big crash. The 17-year-old had arrived at Brands Hatch for the final round of the year hoping to claim runners-up honours in the hard-fought series. But his hopes were dashed after a big crash during Saturday afternoon’s sprint race at the Kent track. After being taken to the medical centre, circuit medics decided to send him to a nearby hospital with fears he may have sustained a pelvic injury, and he was airlifted from the track. Scans proved clear, and although the teenager returned to the track in a lot of pain, he woke up on Sunday morning and felt fit enough to ride. However, he struggled to match the strong pace he had shown earlier in the weekend, and was unable to get close enough to his points rival Tim Hastings. After a brave battle, he completed the 12-lap race in a creditable seventh place, leaving him on a total of 265 points, and third in the championship. “It was probably the hardest race I’ve ever done, I was in a fair bit of pain and I was feeling tired, but I knew I could still get out there and give it a go,” he said. “I was determined I would try as hard as I possibly could because before the race there was still a chance I could get second. “One the race started I knew I was on a damage limitation exercise. I was hurting quite a bit and I knew Tim was further up than me, and that as long as he was ahead, he’d beat me. But by then I just wanted to finish the job properly. I knew I still had third and I wanted to make sure I finished the season with a result.